ustomize tile murals, individual tiles, or any of our products with a photograph or a piece of art you treasure. Whether it's tile murals, custom tiles, coffee mugs, coffee tables, shoulderbags, or any one of our products, Color Bakery can customize it for you. I have a photograph/art I want on coffee tables or on tile murals. Can you do this? Yes we can. We need a piece of high resolution art, so a small, low resolution snapshot .jpg sent via email isn't going to work. However, if you are purchasing a high level item such as a coffee table or a tile mural, we will handle this for you by making a high resolution scan of the image so we can make it ready for printing. We offer this as part of our customization service for larger items like murals and furniture. If you have a piece of original art you want us to reproduce in tile, we do not recommend sending this irreplaceable art in the mail. However, all you need to do is go to a local printing place like Kinko's to get a high resolution digital scan of your artwork so we can work from that. Questions? Email us. Can you customize a photo or image I found on the web? We don't recommend it. Firstly, that image is probably copyrighted and you would need permission from the photographer or artist. In addition, images on the web are low resolution and are meant for quick loading, not for fine art reproduction such as is required with tiles. Images found online don't have enough data in them for print production. Our suggestion is that, if you see an image you like, write to the artist or photographer and ask him or her for permission to use the image for your product. They may allow it for a small fee, and if they do, they can supply you/us with the high resolution artwork for printing. Not sure? Have questions? Contact us. I have a 200 x 200 pixel .jpg. Can you print that on a clock? Yes, but the end result will not be the best of quality. Please remember the quality of the end result is directly commensurate with the quality of the image you send to us. If the image is not at least two megabytes of data, it is assured that the results will not be optimum. We stand behind our products 100%, and we will do whatever we can to assist you, even if it's getting a high resolution scan made for you to print from. Just contact us. I want something special for my kitchen backsplash, like my grandmother's recipes together with a family collage. Can you help? Absolutely. That's where Color Bakery really shines; in fact, it's our calling card. Tell us what you envision and we can make it come alive. Just contact us. Read more about our many services here. I want a custom pattern on a tile to match my living room pillows. Bet you can't do that. You'd lose the bet. Send us photos of your pillows and we can create a custom pattern from the photos. Just contact us. You will be amazed at what we can do. I would like to commission a portrait/custom painting. Can you do this? Yes. If you want a portrait done of yourself, your pet, a loved one; or if you want to have a favorite photograph made into a painting, we can create a piece that is consonant with your vision. We will achieve this by using a photograph you provide. We can then take this art and print it on a tile mural or any other product available on this site. Can you design something just for me, totally from scratch? Absolutely. We can work closely with you to create a beautiful image that you envision, whether it's a digital collage or digital painting, an abstract, still life or landscape/seascape. Tell us what you've been dreaming of and we can make it happen for you. Read more about our many services here. Can you customize a custom tile, tray or shoulderbag for me, using my artwork or photography? Yes we can. If you are a retail customer, go to our upload page and upload your image. You will get a confirmation number via email. Use that number when adding the image to your shopping cart and ordering it on a product. I am a Dallas Cowboys fan. Can you make a sports art collage for me to print on tile? Well, we love Tony Romo too. ;) Yes, we can. We can design an amazing sports collage, from scratch, featuring your favorite football, baseball, hockey or basketball team. Contact us. I love Asian (Egyptian, Moroccan, Russian, Early American Japanese, Islamic) art. Do you have that? Yes. We have a huge collection of beautiful original artwork in many different styles and periods. We couldn't begin to put our full collection online, the site would be enormous and extremely difficult to surf. Please contact us. Most likely, we have what you want, or can create it. Is there an additional charge to prepare my artwork? RESELLERS: If you are a reseller, we do require a minimum of $350.00 worth of merchandise for a customized order. There may be an upcharge, each order is treated individually. We try to waive any prep charges whenver we can. It's only if the prep gets intense (hours), then we talk to you about what kind of charge is involved. END CONSUMERS: If you are a retail buyer/end consumer, there is no additional fee if you upload your own artwork or photo. Make a phony shopping cart (which you can delete at any time) to see how much the total will be with shipping. I don't have a company logo. Can you design one for me so I can use it on your products? Absolutely. Mindy Sommers is a professional graphic and logo designer as well as a professional artist, and she has been a professional logo designer for years. She can definitely design a logo that reflects your company's unique vision. I already have a logo, and would like to use it in tandem with Color Bakery artwork. Can you do that? Sure! Many of our customers have done just that. In fact, you can see coffee mug examples of that on the very top of this page. How long will it take to customize, say, a coffee table? That depends. Are we designing the art or are you supplying it? Obviously, if it's the former, it will take longer since we have to create the art first. 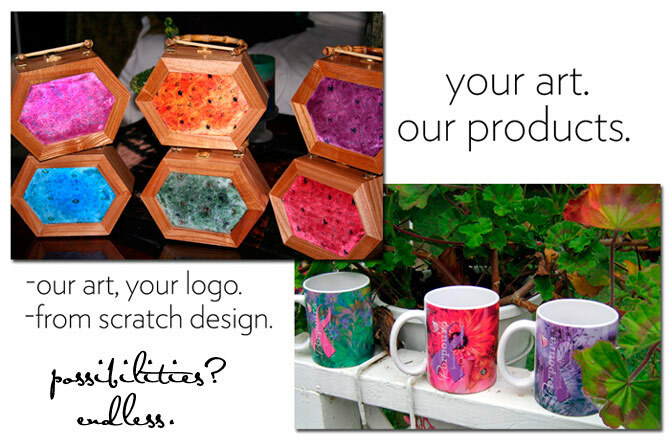 But if you are supplying the art or photography, most orders take between two and four weeks. I really like your "Purplescape" image, but I am not a purple person. Can you make it in blue? What size image do I need to upload for my customized order? More information about that is on our upload page. We are always available to respond to questions. I hope you enjoy your visit to Color Bakery, and we look forward to hearing from you soon. Wholesale buyers, artists and those interested in customization may call us at 1.802.287.9098, 11-5 Eastern time, seven days a week. Or click here to email us.